I don't know if I'm running on empty, but I'm definitely running behind. last week we returned from a vacation to the pacific northwest, no sooner than I had all my clothes washed and I was off again. thursday morning I headed down to metro dc to spend a few days with my folks. outside of time spent with family, I did get in one outing worth mentioning. 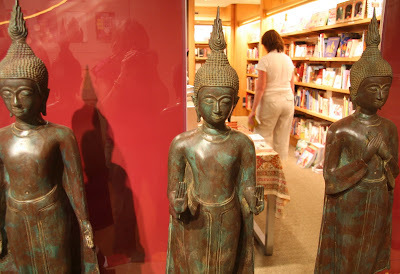 when I arrived at union station, my sister met me and we headed over to the smithsonian's arthur m. sackler gallery in order to check out the current exhibit in the realm of the buddha. it was outstanding; if you find yourself in washington between now and july 18th make sure to drop in. I totally fell in love with a large statue of the white tara done by the 18th century phenom situ panchen. why is it that they never sell postcards of one's favorite pieces from special exhibits - and of course since it was a special exhibit no photography was allowed. for now the image is emblazoned in my memory and who knows maybe some day I'll run across the statue again or a print of it. I'm glad I checked out the gift shop to see if they had a print/postcard of the statue as the shop had a wonderful display of six statues showing various buddhist mudras. in the photo below, the center statue shows the gesture with both hands with palms facing out, placed below the waist means to 'calm the floods' - the mudra on the right with both hands crossed placed on the chest is the vajrapradama mudra which is the gesture of unshakable confidence. nice eh? I missed celebrating my mother's 85th birthday with her on may 1st as we were on the west coast, but I was able to spend mother's day with ma and have the added bonus of being with all the members of my family of origin. my sister annie was visiting from her current home in zambia; she was doing a bit of reconnaissance for her family of creation as they will be moving back to the area this summer. sunday was particularly special as all three sibs were together with my parents - it was fun to have us "kids" working together to prepare the mother's day feast. even though we are getting up there in age when one's folks are still around we will always be 'the kids' - we are so grateful to have both of our parents with us - given our parents ages, having them still here, makes each day a gift. 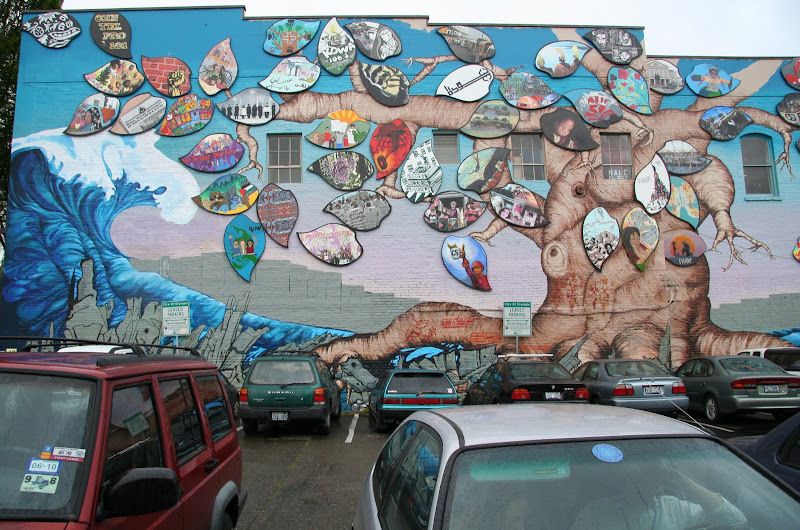 I had a post planned for mother's day - using this great mural in olympia washington as the focal point, but what can I say things happen so my happy mother's day post didn't get up. but, I'd still like to share a couple images of this wonderful mural. on the corner of state and capitol is a very large mural which is called the olympia/rafah solidarity mural; according to the mural's website, its purpose is to recognize "all the people who struggle and work for justice." the catalyst for the mural is the tragic event which united the two cities of olympia and rafah palestine - the a tragic event was the unnecessary and untimely death of rachel corrie. each leaf on the tree celebrates a particular social justice project or organization. one leaf, at what I would consider the heart of the olive tree is of a mother holding a baby and has a caption which reads 'every mother is a working mother.' the leaf was sponsored by and honors POWER (parents organizing for welfare and economic rights) and was created by quinn russell an olympia artist and mama of twins. I don't have any travel planned for the next month, maybe I'll be able to settle down and get caught up on things - but some how, I'm seriously doubting that, best I can do is try and just keep filling up my tank so I'm not running on empty! jackson browne performing his 1977 signature song running on empty. in 2005 rolling stone listed the song among the 500 greatest songs of all time. A great and far-travelling and travelled post. 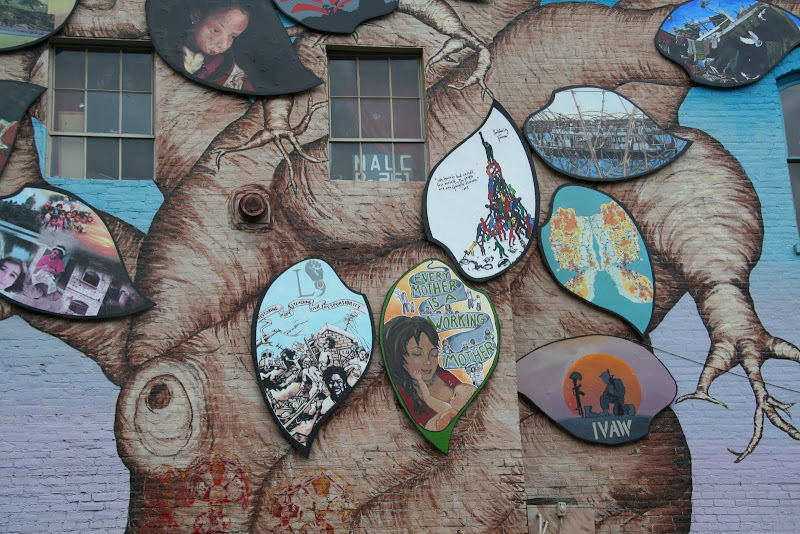 I especially like the photo of the mural and appreciate the link to the Rachel Corrie site. I remember her death. I was going to say her 'senseless' death, but that would do her sacrifice a dishonor by implying that there was anything 'sensible' about the so many deaths and suffering that spurred her to protest. Another interesting, colorful post from you, as always. I am so happy you got to spend Mother's Day with your parents. I spent my Dad's 85th birthday with him in Cannon Beach in April; I'll be having brunch with my Mom to make up for the fact that she was too busy Mother's Day weekend to have company. What a great mural that is! Thanks for showing it to us, and providing the links. What an amazing piece of creativity to spring from such a sad event. The mural is just fabulous. Thanks for sharing it with us, Kimy! Thanks for introducing me to two more places I knew nothing about. The mural honouring Rachel Corrie is spectacular, and I love the idea. Hope you find the picture you want from the Buddhist exhibition! Here you are...with so much going on and running on empty...and you still manage to give us a wonderfully interesting post. Thank you...this is an awesome! And now I'll be checking out the links. The mural is very beautiful and very moving. And I love the mudras. They look so peaceful. sounds as if you had a very special mother's day. such family moments are to be cherished. glad you could all be together. the thought of it makes me almost misty with happiness for you. take care of yourself. i sense you are feeling torn by "obligations." if so, let them be for now.